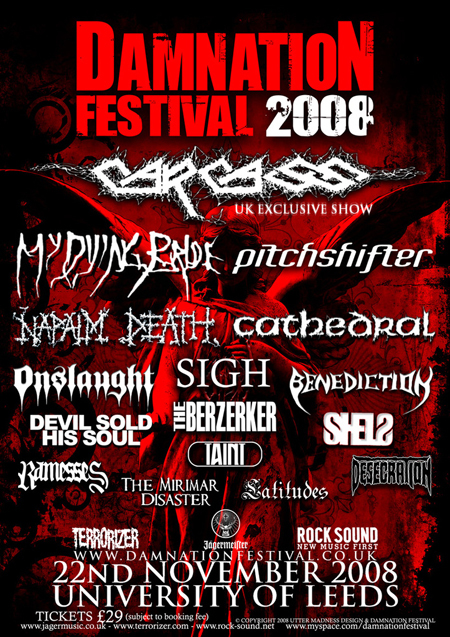 UK doom legends have been confirmed for the Damnation Festival 2008, set to take place Saturday, November 22 at England's Leeds University. Also newly added are progressive metallers DEVIL SOLD HIS SOUL and THE MIRIMAR DISASTER. According the organizers, this year's festival has been expanded to a full three-stage, 3,500-capacity event. Rock Sound magazine will sponsor the third stage with rising post-metal talent SHELS, LATITUDES and doom merchants RAMESSES taking the stage, with more to be announced. Festival director Gavin McInally said: "With more tickets sold for this year's Damnation Festival in the first month than we managed in the whole of last year, it was a simple choice; lock out the fans, or take the plunge and add the huge 2,000-capacity refectory. "Damnation Festival will now host three stages rammed with talent and we're delighted to welcome Rock Sound on board as our newest partners — they've been at the forefront of breaking bands for over a decade, and we pride ourselves on doing the same!" Tickets for Damnation are on sale now priced at £29 (subject to booking fee). For more information, visit www.damnationfestival.co.uk.